How To Choose The Best File And Folder Synchronization Tool? Nowadays, as users work on multiple computers, it becomes inevitable for them to use file synchronization tools. Again, different people in a team work on the same file which makes it necessary to use file sync tools to collaborate with the entire team. Using folder sync tools help users view changes made by different people on a single document. A file sync application cuts down the labor of manually syncing files and folders on multiple computers. Therefore, the file is available to everyone even if they use different computers. However, file synchronization also backs up your data and thus you can restore all your valuable files from the tool in case of any bad incident. Reliability: The tool should be technically advanced. It should seldom crash or freeze. Moreover, the tool should have an awesome customer support. Of Useful Features: You should look for the number of features in a software and ensure that those features are useful to you. The tools should include basic features like schedulers, automatic backup and also other advanced sync features. User Interface: The user interface should be intuitive, user-friendly and without any frills. These are three basic aspects every file sync software should consist of. Well, we have come up with a list of file sync applications that cover all three aspects. We have made it easier for you! Right Backup is undoubtedly one of the smartest cloud storage solution we have come across so far. It can be called as the easiest and most secure cloud storage service in the list. The software auto-syncs your entire PC’s data in regular intervals (as per requirement). It is user friendly and works with any operating system. The software also backs up and smartly restores the data when required. It can prove as a great equipment for your computer. You will like it for sure. Click the button to download Right Backup. DropBox is one of the best file synchronization tools that instantaneously synchronizes files on your PC and their web-oriented interface. DropBox has four versions in the market- DropBox basic, DropBox Plus, DropBox Professional and DropBox Business according to your requirements. DropBox Professional is a good pick if you want to enjoy the privileges of a premium user. It has a great user interface will enable to auto-sync all your data on the cloud without any hassle. Go for it! Click here to download DropBox. You can easily sync files and folders between Windows computer with the help of Windows OneDrive. It efficiently supports Windows (we just completed syncing Firefox extensions on Windows computer) and plays a great role in collaborating with MS Office Web Apps. you can save and edit Office documents online through OneDrive. The software is available in four different versions- OneDrive basic, OneDrive, OneDrive premium with Office 365 Personal and OneDrive premium with Office 365 Home. Windows have already similar products like Windows Live Mesh, Windows Sync and others in the past. OneDrive is without doubt, worth a try. Syncplicity For Windows is a premium file synchronization tool that provides seamless and immediate file synchronization to your Windows computer. Like DropBox, Syncplicity also allows you to monitor the synchronization status of your data. The software has many features like secure mobile collaboration, file share replacement, storage infrastructure consolidation and much more. The online storage gives much importance to data sovereignty and security. SyncBack For Windows is one of the best folder synchronization tools. It’s powerful, super-easy and is insanely flexible. There are four versions of the software- SyncBackFree, SyncBackLite, SyncBackSE and SyncBackPro. SyncbackPro is entirely loaded with great features like powerful scripting support, Zip64 compression Encryption, SMART warnings, fast backup and so on. The softwares costs $54.95 (it renews annually). Synchredible is an amazing folder-file synchronization tool that can sync the entire hard drive or individual files. The software is so user-friendly that its wizard will allow you to easily manage sync options. Synchredible also syncs files and folders through USB drive or an external network. The tool also backs up your data simultaneously while you sync your data. The software supports nine languages and includes features such as setting buffer size of duplicate buffers, CRC32 verification, synchronization preview, synchronizing subdirs, edited and unedited files, and bi-directional file synchronization support. In a nutshell, Synchredible is a great solution for data backup and data synchronization if you want to don’t want to do it on cloud. You can buy the professional version for $28. Click here to download the software. Our article ends here. 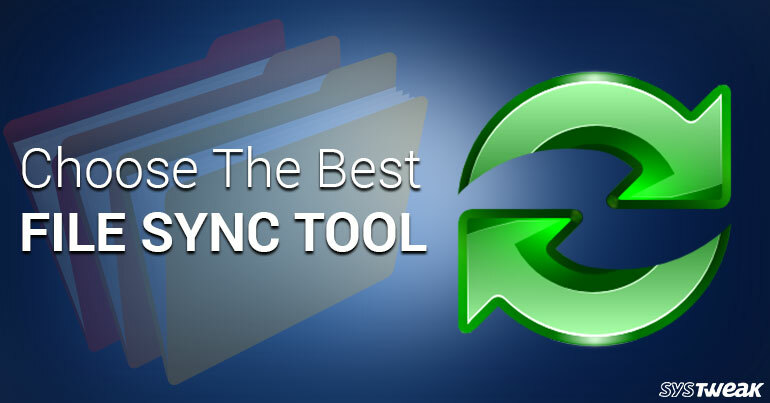 We recommend you to recall the above mentioned points while choosing the best file sync tool for your Windows computer. Moreover, as discussed above, you can certainly try our ‘hand-picked’ list of file synchronization software for you. They are absolutely powerful and insanely loaded with features. Hope the list benefits you and select the tool that meets your requirements.